Our special Sta-Stuck sprayable contact adhesive is an adhesive that will reliably stick our foam and mineral wool products to a wide variety of surfaces with no adverse effect. It has low odour with a high solids content and is water and heat resistant with permanent flexibility. This glue is also useful for sticking a wide variety of other materials but not our Soundproofing Mats, M20AD wall insulation or plasterboard. It is particularly good to work with due to its low solvent content which does not leave strong fumes lingering after use. PLEASE NOTE !! THIS IS A CONTACT ADHESIVE. ONCE THE PRODUCT IS OFFERED UP TO THE SURFACE AND STUCK IT CANNOT EASILY BE RE-POSITIONED. Shake can well before use (especially in cold conditions) Best results are obtained when working in an ambient temperature of 70 deg F/21 deg C with surfaces to be bonded properly conditioned. If working in cold temperatures, ensure the adhesive is kept warm otherwise it may not spray properly. Ensure all surfaces are thoroughly clean and free from moisture, dirt, dust and grease or any other materials that could affect the bond. For vertical or horizontal patterns, turn tip in spray nozzle clockwise to the widest spray pattern setting. Hold spray can 6 to 8 inches from the surface and apply in even coats, making sure the adhesive ‘webs’ across the surface. Do not hold closer than 6 inches or apply too much to the surface to avoid longer tack times. In cold conditions the tack time before bonding will be considerably longer. 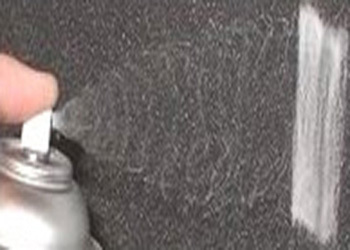 Spray pattern for Sta-Stuck aerosol adhesive developed to glue sound absorbing foam and acoustic mineral wool. The adhesive must be sprayed as shown in the picture above. One surface should be sprayed vertically and the other horizontally before bonding. Do not concentrate in one spot or allow the adhesive to ‘puddle’. Double coating applications are recommended on more porous surfaces (after the first coat has dried, apply a second coat evenly on top). Allow adhesive to tack (usually up to 4 minutes) and bond together with a firm pressure over the entire area. Tack time can vary depending on climate conditions. It is important that maximum uniform pressure is applied to over the entire area bonded to achieve maximum bond strength. Use the Spray Contact Adhesive in well ventilated conditions. For bonding our M20AD wall soundproofing panels, SBM5 Soundproofing Mat or Acoustic Plasterboard panels you will require a different adhesive.